'A House with Spirit' is available from Anne Loader of Leonnie Press and also direct from Feathers Centre in Northwich. This is a local history book with a spiritual difference, researched and written by Jackie Dennison & Christine Hamlett, and published by Leonnie Press. The book is a dedication to Marbury Hall, nr Northwich in Cheshire, and the families that lived and worked there. Including information on the resident ghosts, some of which have been captured on camcorder, in sound and pictures by Jackie and Christine. 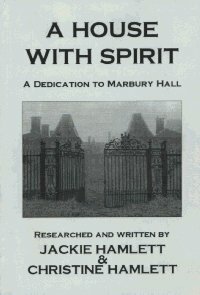 A House with Spirit is a factual book concerning mainly the Smith-Barry, Barrymore and Smith families, with a section of the book that tells the tales of the Spirits that still visit the site of the former Smith-Barry Mansion. This is incorporated also with our own experiences there, and our encounters with the Spirit forces that like to visit. There are many ghost stories connected to Marbury Hall in Cheshire. The two most famous are 'the Marbury Lady' and the horse 'Marbury Dunne'. I have encountered both and many more besides at Marbury, whilst I was in the company of Christine, my former sister in law, and others including my youngest brother Bryan. My eldest brother Kevin (Christine's former husband) has also witnessed a very strange ghostly sighting of a horse and carriage. He both saw and heard, the horses and the carriage dashing along at tremendous speed, only to overturn. Further research revealed that a horse and carriage belonging to the Smith-Barry family of Marbury Hall, did indeed overturn, and one of the coachmen was killed in the accident. Marbury Lady. - Is associated mainly with James Hugh Smith-Barry (1748 - 1801), who in 1787, inherited Marbury Hall from his Uncle Richard Barry. James, in his youth, spent much of his time in Italy, Greece and the Levant. Whilst there he built up a collection of antiquities and works of art, which he housed in Belmont Hall, the house he inherited from his father. It is at this point that the story surrounding James Hugh becomes a little clouded, and it is easy to see where the myth and the truth overlap. Myth - It is said that on one of his travels he met with a lovely dark skinned, exotic Egyptian girl. He fell madly in love with her, and when he had to return to England, he told her he would send for her to follow him and make her his wife. When some time later he returned to Marbury, he discovered that his family had arranged a good marriage for him. His protestations went unheard, as he was told in no uncertain terms that if he did not do as they wished, he would be disinherited. However, when he met his bride to be, he was pleasantly surprised. In fact she as so beautiful that he fell in love with her and forgot all about his dark haired, dark eyed beauty. He married, as his family wished, and was intending to live happily ever after, until one dark night when there was a knock upon the door of Marbury Hall. There at the doorway was the Egyptian girl, that he had pledged his love for. Although shocked, he was pleased to see her, and explained her presence, as a servant looking for work. Soon the pair once again became lovers, and had 5 children. She made him promise that should she die before him, she wanted her body to be embalmed and kept at Marbury. An ominous request?, for she did die before him, and true to his word, he placed her embalmed body in a wooden chest at the foot of a spiral staircase in the hallway of Marbury Hall. When he died some years later, the family were not too keen on inheriting what they considered to be a mummy in a coffin, inside the house. They arranged for a decent burial at the nearby Gt. Budworth Churchyard. What they did not expect however, was the hauntings that would follow. It was reported by the locals that they had seen a white misted lady floating around the grounds of Marbury Hall. Servants inside the house reported cupboard doors, and drawers that would open spontaneously. Doors would close of their own accord, and strange sounds would be heard. Eventually the family brought the chest containing the mummy back to the hall, and the hauntings seemed to stop. A few years later, the body was again moved to the churchyard, and almost immediately the hauntings started again. She was once more returned to the Hall, and the foot of the spiral staircase. Fact: The chest was still visible in Marbury Hall when it was converted to a Country Club in 1932. Eye Witnesses that we have spoken to, swear that they have seen the chest with the wrappings of a mummy still there, with a handful of bones in the chest also. In a Country Club newsletter, that is in our possession, directions were given to the place, behind the swimming pool, where the lady was buried. Although various stories tell that she was buried in the rose garden, the newsletter was very precise on the exact location, pacing the steps out to a place where a small stone lay, to commemorate where she was finally laid to rest. Sightings of her are still reported to this day. The last known sighting to my knowledge, was 2002 behind the swimming pool! Fact also that shows where the myth would overlap. Although James Hugh Smith-Barry never married, he lived with his mistress, and former housekeeper, Ann Tanner. The family lived mainly at Swerford Park in Oxford (a house that we have also visited in the course of our investigations into 'A House with Spirit'.) They had 5 children, the eldest of which John Smith-Barry inherited Marbury Hall in 1801 . He also inherited a hunting lodge in Cork, Ireland, Foaty House. Fota, as it is now known, is another of the Smith-Barry properties that we visited during our research. In fact we stayed at the mansion in a wonderful weekend visit, staying in the company of the caretaker Tina Neylon, her daughter Eve, and the many spirits that chose to welcome us. James travelled to Egypt, Italy, Pompeii, Constantinople, etc. on many occasions, building up a magnificent collection of artefacts. He never really settled in one place, and his children were left fatherless at a young age. Anne is somewhat of an enigma. Shortly after the death of James, she married the butler and a short while later, they both seemed to disappear from any records. Personal Experiences. I was driving through Marbury when I saw a beautiful maroon and cream car driving towards me. It was similar to the old fashioned Bentleys, and quite magnificent to look at. As it approached me, I admired it, and thought how the colours complimented each other, and that cars weren't made like that anymore. I thought there must have been a car show on locally, and watched as the car passed me. I didn't notice the driver, as I didn't look. As the car went past me, I couldn't resist a second look in the mirror. There was nothing there!. I was so shocked as the car was really solid. You would think that with the type of work that I do, I would be used to this sort of thing by now, but the day I stop being surprised and delighted, is the day I give it all up.